Super Eagles winger, Victor Moses is nearing a first-team return with Chelsea as he shared footage of himself taking part in aerobic exercises in the swimming pool. The Nigerian has been sidelined since picking up a hamstring injury in the 2-1 defeat by Crystal Palace at Selhurst Park earlier this month. But he promised in a post on Instagram that he will be back playing sooner rather than later despite being ruled out for a month at the time. Alongside the video of him stepping on and off a yellow board in the pool, the 26-year-old wrote: ‘Putting the work in will be back soon! #roadtorecovery’. 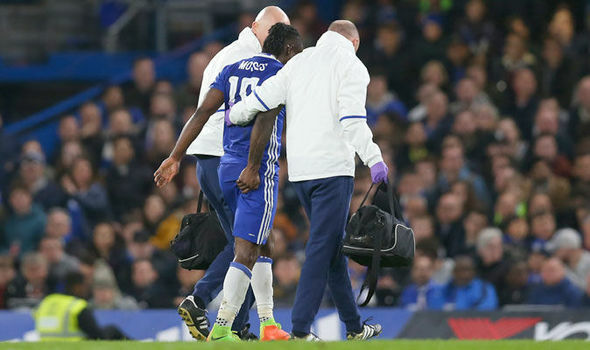 Moses’ determination to show he is on the path back to full fitness comes just three days after Antonio Conte admitted he could face further time away from the pitch.